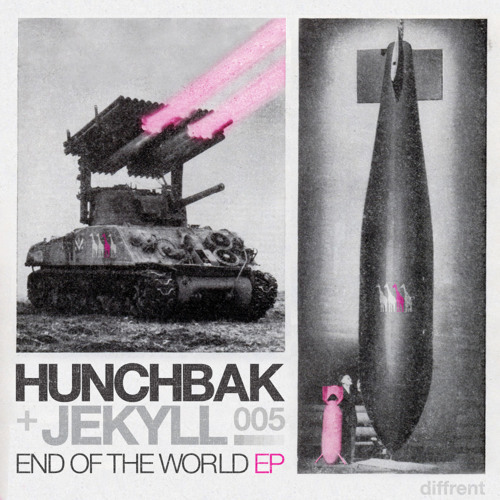 Diffrents first extended player is packed to the brim with tight polished grooves and low end perfection, brought to you by the geniuses that are ‘Hunchbak’ and ‘Jekyll’. The disturbing vocals and eerie atmos of ‘End of The World’ instantly set the tone, followed up by an atom bomb of textured filthy bass and piercing percussion. Next in is ‘Low Frequency Oscillator’, a deep stripped back groove layered up with a moody sub thats guaranteed the get your head nodding. ‘Insect Flex’ brings you a truly mouth watering instalment of growling sub combined with some irresistibly techy vibes, and to cap it off ‘The Cure’ soothes with a warm profound sound mixed with high quality beats that will shake walls everywhere. All in all a flawless collection of tracks that breaches sonic boundaries, redefines the term unique and gives drum and bass that fresh new perspective its been waiting for. This truly is ‘Diffrent’ so what ever you do, bag it….NOW!